The temperatures are finally easing up a little after a good few weeks of hot weather, and last night brought heavy rain with the latest of the thunderstorms lighting the sky with silver, the sound of horses galloping in the heavens resounding everywhere. The herbal harvest proceeds apace, with Limeflowers (Tilia europaea) in baskets everywhere, drying and filling the house with their soporific fragrance, as well as the last of the rose petals next to the fireplace, plus leaves and flowers of Rosebay Willowherb drying for teas. Recently I have been busily making a fair few infused oils – this time I made two different batches of rose petal and am currently working on my second batch of St John’s Wort flower, which is busily loving the sun and turning a glorious rich red colour. With the two rose oils, I’ve done two different batches – one lot was done using mostly dried petals, in the double boiler, on the hob, and the other was done using sun infusion, put in a jam jar on the table in full sunlight. So far, the sun infused version is definitely the more fragrant of the two, however I’ve got my suspicions that it will not last long as it is very cloudy. No surprise there, as fresh rose petals do have a rather high water content! Still, it has been fun to experiment with, and I will post more information once I have filtered the second of the two oils. The meadowsweet is currently flowering as well, and makes a really fantastic oil for sore muscles and joints – I shall be making copious amounts of it once the meadowsweet has dried out from last night’s rainstorm! 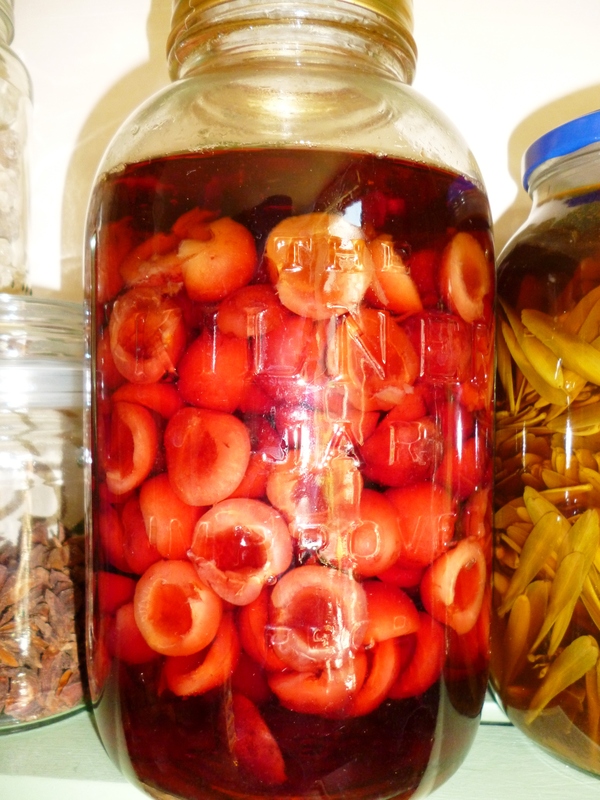 I’ve also started the first batch of cherry brandy off, ready for the Yuletide season – next up will probably be damson gin, and possibly some plum brandy as well as the local trees look as though they will have a bumper crop on this year, especially if we keep getting plenty of rain! You will need at least two punnets of cherries, two heaped tablespoons of sugar (I used raw organic cane sugar) plus a bottle of cheap brandy. Own brand from the supermarkets is usually just fine. 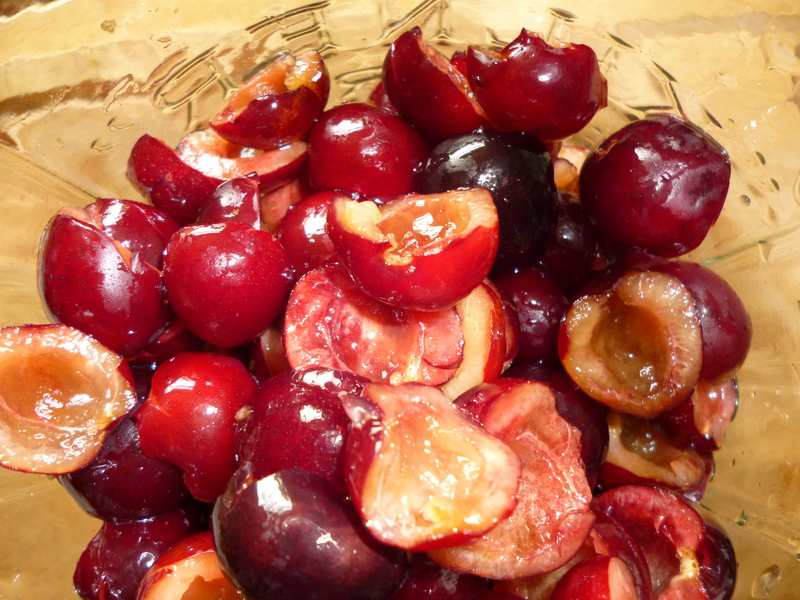 This is very simple to make, simply cut the cherries in half, remove the stones and pile them into a clean kilner jar. Sprinkle the sugar on top, then pour over the brandy. I added a stick of cinnamon as well so this should have a lovely rich, warm flavour once it has finished brewing. Put the lid on the jar, shake up thoroughly and leave to infuse for at least two weeks. The fruit can be saved for puddings, pies and stewed fruit once the brandy has been filtered, and is just delicious on its own! I may even try putting them onto cocktail sticks and dunking them into melted chocolate, then leaving them to set! Lately I’ve been trying a few new recipes, the latest of which has been an adaptation of the pickled ash keys recipe from the Hedgerow Handbook. I’ve noted down here what I did, and will report back on the resulting flavour in about 6 weeks time, when they have had time to soak and mature a little! Ash keys, ready for preparation. For the ash keys – two tbsp salt, lots and lots and lots of water, at least 400g of fresh green ash keys (the younger the better), plus between two and four large garlic cloves, 12 mustard seeds, 10 white peppercorns. 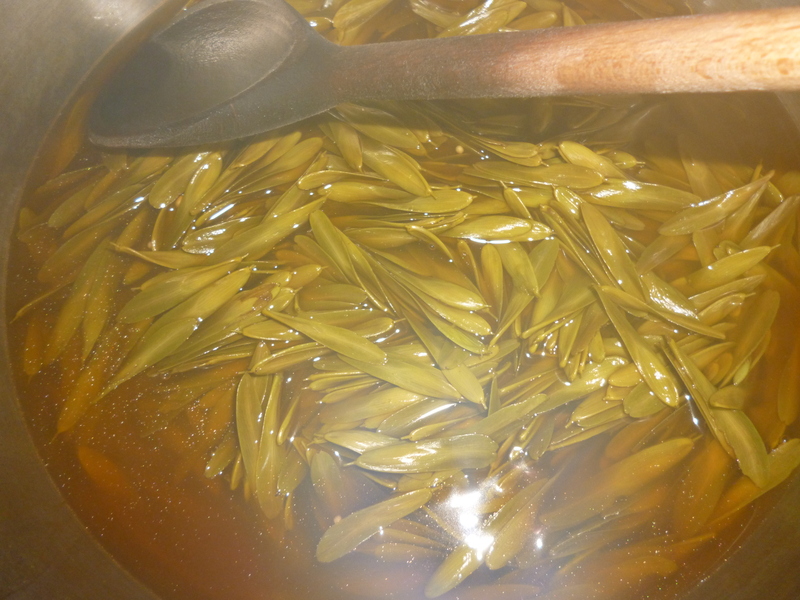 This is a fairly labour intensive recipe – the ash keys need to be stripped from their stems and thoroughly washed, then put into a pan with plenty of water and boiled for 20 minutes. Rinse, replace the water with a load of fresh stuff, then boil again for another 20 minutes. This needs to be repeated four times in all, and then strain and add more water, plus the salt. Boil thoroughly for 15 minutes, then simmer for an hour, keeping the pan covered. The ash keys should start to soften. While the ash keys are boiling for the first 20 minutes, put the malt vinegar and spices into a pan, bring to the boil and then simmer for ten minutes before setting the whole thing aside to cool. …Toil and Trouble… I just hope the results are worth it! 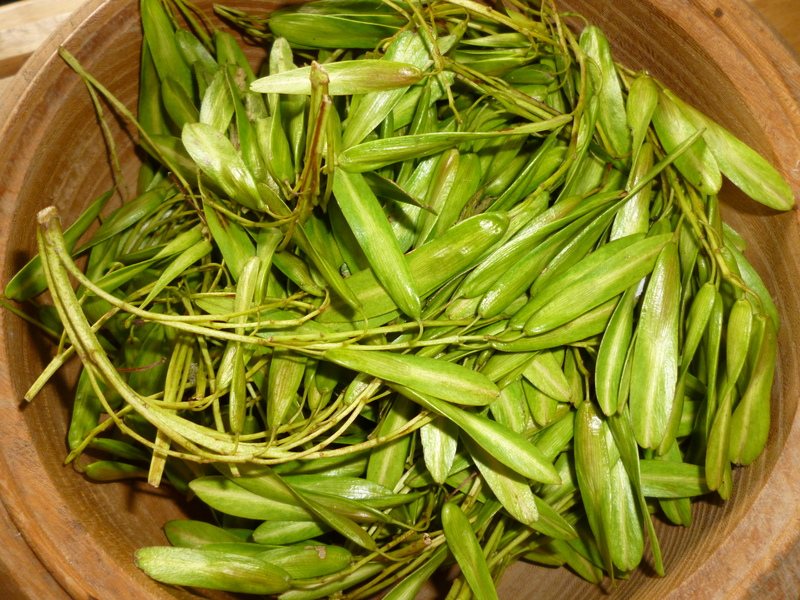 Once the ash keys have finished their cooking, put them into the pan with the strained vinegar, bring to the boil and simmer for ten minutes, then leave to cool. Spoon the ash keys into a clean jar and pour the vinegar on top, then lid tightly. These need to be left to mature for 6 weeks in a cool, dark place before eating, more if possible. Feedback so far on this recipe – I deliberately used milder spices because I don’t much care for really spicy foods, and the vinegar and spice mix smelled amazing! Despite repeated boiling and simmering, the ash keys were still rather tough even when they were ready for putting into the jar, so I don’t know how good this particular batch will be. It is possible that I just needed to pick smaller ash keys, but its worth leaving them for 6 weeks I think and just see how things turn out! Thank you for sharing your recipes! I must admit that I am unfamiliar with ash keys. I must read up on them. Next Next post: Lammas and Blackcurrants and Hares, Oh My!